Tomorrow, early, I start on my bike trip–my own Tour de Taihu. I will set off from my place in Pudong, cross the Huangpu River by ferry and follow Suzhou Creek to Kunshan. From there I will ride past Suzhou, past Mudu and hit Taihu in the early afternoon. Then I will ride around the lake, clockwise, finishing up in Suzhou somewhere around September 29. In total I will log around 600km. As far as I know, I will be the first foreigner to do this. 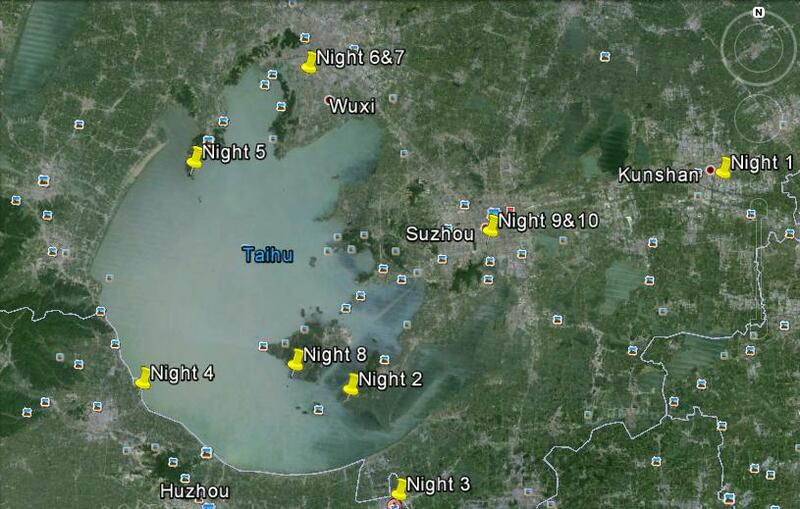 The idea of circling Lake Tai (Taihu) on bike has been in my mind for awhile now. I’ve been wanting to hit the road on my bike and Taihu seemed feasible. Plus it’s been years since I last saw it and what I saw back then I really liked–Zhenhu, Guangfu Temple with its little iron Buddha, the workshops which churn out the huge carved wooden Buddhas you see in so many temples all over China, the hotel perched on the lake shore with a perfect sunset view. Over time I developed a picture in my mind of myself zipping along on the bike, the lake in the background, reeds where the water meets shore, blue sky lowering into evening, everything bathed in the golden sunlight of autumn. On August 16 this year just over a month ago, I decided I would do it. Moreover I decided I would do it for a cause I believe in: the environment. Part of my reason for doing this is because I want to do something that I believe in. I realize that this happens far too infrequently in life. Earlier this year I was fortunate to participate as a judge in the Rotary Leadership Awards in Shanghai. City Weekend was a media sponsor and so they invited me to join. Leading teams at Ringier, I know something about leadership, but then reading the applications of the people who not only lead but do so not in quest of treasure or power or fame, but of something else I realized that I was hardly qualified to judge. After that event, I decided I wanted to do something for a cause beyond my own narrow benefit. Tour de Taihu is meant to raise awareness about the importance of the natural world to encourage people to think about the natural world. What they do with that awareness is up to them. I’ve never done anything like this before, though I know people who have. I want to prove that I can do it. And in doing so I hope to show other people that they can do it too. What “it” means is different to everyone. But whatever it is, lack of time and money are not good enough reasons not do it. I’ve had plenty of help in prepping this adventure. Special thanks goes to my three sponsors: Factory Five in Shanghai, Serk Bike cafe in Beijing and World Health Store. The good folks at Factory Five kindly donated a set of panniers. Serk is a media partner helping to spread the word. World Health Store hooked me up with a bunch of new Twinlab products and they will also help promote the trip through their channels. I will publish the whole story in City Weekend next month. Beyond that, my colleagues, family and friends have been amazingly supportive. This was a very pleasant discovery. It turns out when you put your mind to doing something different for a good cause, people rally behind you. People help with encouragement, advice, inspiration, everything. So even though the bike trip is solo, there are really a lot of people behind it. That’s also something we forgot so easily. Life isn’t a one-man journey, even if ultimately that’s the way it ends up. There are dozens, hundreds, thousands, millions of invisible hands holding us up. This entry was posted in Travel by whiteconfucius. Bookmark the permalink. Just don’t get hit by a truck.